Ornamental small to medium shrub with fine foliage and yellow flowers. Plants are variable in height according to seed grown. 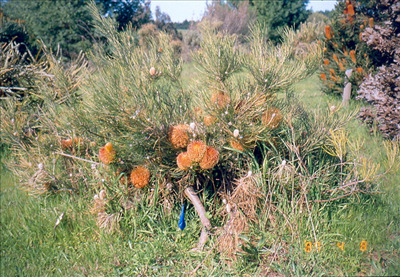 Plants can range from 3' to 6' or one variety B. sphaerocarpa var. dolichostyla can reach 9'. Frost and drought tolerant. Suitable to most soils and situations, including coastal exposure. Useful screen or low windbreak. Great container plant.